Research In Motion (RIM) is known first and foremost for its BlackBerry smartphones, but the Canadian company also manufactures and markets a wide-variety of related software and accessories, including its BlackBerry Enterprise Server (BES) and BES Express for corporations and a number of cases and holsters for devices, along with audio-video peripherals, like Bluetooth headsets and media streaming gadgets. 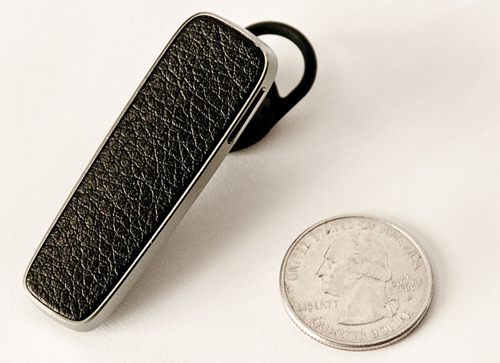 RIM’s latest BlackBerry accessory, the BlackBerry HS-700 Bluetooth Wireless Headset, is small and light, sleek and unobtrusive. It supports third-party Bluetooth devices, not just BlackBerrys. And with its handsome “faux-leather” front surface and matte-silver edges, the BlackBerry HS-700 is less of an accessory than a business tool; instead of screaming, “Look at me” via blinking lights and shiny edges, the BlackBerry HS-700 is designed for subtlety and function. In other words, if you’re looking for a Bluetooth headset to compliment your Saturday-night-getup at the clubs or otherwise grab the eyeballs of passersby, you’ll want to look elsewhere. Overall, I’m quite impressed with the BlackBerry HS-700 Bluetooth Wireless Headset, and despite a few minor complaints, it has become my go-to Bluetooth earpiece. Keep moving for specifics. First up: What RIM did right. The first thing you notice about the BlackBerry HS-700 headset is its faux-leather front-side, which is the headset’s most visible surface. BlackBerry enthusiasts will quickly see that the leather is the exact same material RIM used for the BlackBerry Bold 9700 smartphone’s battery cover. And it’s also very similar to the leatherette material used to compose the BlackBerry Bold 9000’s battery door. In other words, any BlackBerry user with a Bold 9000/9700 device will find that the HS-700 nicely compliments their handheld, since the headset’s matte-silver edges also match the bezels found on both of those devices. The HS-700 doesn’t have any visible RIM logo, except for the word “BlackBerry” that appears in tiny lettering on the inside surface of the gadget (the side that touches your face while in use). But it’s barely visible even when you’re looking for it. This is in stark contrast to the huge BlackBerry “seven-dot” logo plastered on the face of RIM’s last Bluetooth headset, the HS-500. I think it was wise for RIM to do away with that glaring BlackBerry logo, since it really restricted the HS-500 to BlackBerry users, even though the device works with a variety of Bluetooth-enabled gadgets. After all, what self-respecting iPhone user would buy a headset with a giant BlackBerry logo? My favorite thing about the BlackBerry HS-700: the automatic volume control feature, which adjusts the volume of your calls based on the level of noise around you. In general, I found the feature to work great, and it’s definitely nice not to have to fiddle with volume controls every time you drive through a tunnel or roll down the car-window to pay a toll. This auto-volume feature isn’t specific to the BlackBerry HS-700, but it works as good as or better than any other comparable features I’ve tried on additional headsets. The HS-700 can also be employed almost completely using voice controls, though this can be frustrating in some instances. Or you can use the device’s call control key to perform most basic functions including answering calls, ending calls, switching between callers and muting the volume, all of which are fairly simple once you memorize the specific commands. If you’re using a BlackBerry, the HS-700 can access your address book and announce the name of the incoming caller, where available. I got about five hours of use from the HS-700, which is decent. And you can listen to music and other audio through the headset from sources including your media player, streaming-music apps like Pandora, and GPS navigation apps with spoken driving directions like TeleNav Navigator. The HS-700 comes with four different size in-ear gels and two over-the-ear hoops to help you find the best fit. I was able to use just one in-ear gel with a “stabilizing” rubber hook and no over-the-ear hoop. And I found the HS-700 to be one of the most comfortable Bluetooth headsets I’ve ever used, though the fit will vary depending on users’ specific ear-size and shape. Finally, the HS-700 packaging is pleasant looking, and it’s definitely a step up from the boring packing RIM has used in the past. In fact, the HS-700 packaging looks an awful lot like popular headset-maker Jawbone’s recent packaging…and that’s likely no accident. RIM knows how popular Jawbone headsets are, and it’s no doubt trying to grab the eyes of potential Jawbone buyers before they make a decision. I know that’s a lot to like, but there are two sides to this story…even if the second one is significantly less wordy. Now, on to the HS-700 weak points…. VSuite works just fine in some cases; it picks up spoken phone numbers and other numeric values like a charm. But as soon as you speak any sort of long, multisyllabic words, proper names or terms with “unique” pronunciations, the software becomes about as useful as a cell phone in a wireless dead zone. During my test, I constantly found myself repeating contacts’ names after the HS-700 explained that it can’t understand me. I raised my voice and tried speaking more clearly, to no avail. I tried again, with no luck. And again, until I ended up insulting the gadget and its pre-programmed voice and just using my phone’s keypad to dial the number, since I rarely remember contacts’ actual digits. I also frequently had trouble with the HS-700’s basic menu options, which really shouldn’t be an issue since the headset does not use Nuance for these specific options, and you’d think it would be programmed to easily recognize a few main spoken commands. Obviously, that’s not a good thing. Answering and ending calls, switching between calls, redialing, etc., sans hands is fairly simple via HS-500. But the experience placing calls via the BlackBerry HS-700’s voice-recognition system is almost identical to any modern BlackBerry. And if you’re familiar with the current voice recognition tech used in today’s BlackBerrys, you know that’s really not a good thing either. I was generally pleased with HS-700 call quality on my end, even when I tested it while driving 80 MPH down the Massachusetts Turnpike with all my windows open; the automatic volume control kicked in nicely, and I could hear the person on the other end of my call just fine. However, I got a number of complaints from the folks on the other end, especially while the wind was blowing strongly. This can be expected; no Bluetooth headset can block out that noise completely, but I was disappointed in how often I heard, “Where are you? I can barely hear you?” while driving. The HS-700 is also quite expensive, at $129.99 on both BestBuy.com and RIM’s own ShopBlackBerry.com. The BlackBerry HS-500, RIM’s last Bluetooth headset, was priced at $79.99 at launch, and it would’ve been nice to see the new HS-700 come in right around $100, which is about as much as I’d be willing to drop without feeling like I overpaid. This is a relatively minor complaint, but I wish the micro USB cord that ships with the HS-700 for charging was a bit longer than just 12 inches. And I think the cord should have come with a car-charger adapter in addition to the AC-power plug it ships with, since most folks probably use their headset while in the car more than any other locale–especially with that hefty price tag. And to sum all that up…. All and all, I’m a big fan of RIM’s latest, and I say without hesitation, greatest, Bluetooth headset, the BlackBerry HS-700. It’s handsome-looking, works with a variety of Bluetooth-enabled devices, is subtle and it makes one heck of a pair with my BlackBerry Bold 9700 smartphone. I’m more of a Bluetooth speakerphone kind of guy for in-car, hands-free calling and on-device music consumption, but I always keep a Bluetooth headset handy and the BlackBerry HS-700 has for the time being replaced my trusty BlueAnt ear-piece. The HS-700 doesn’t exactly deliver on RIM’s promise that it provides the ultimate hands-free calling experience, due to the fact that it/my BlackBerry still has trouble recognizing many spoken names and/or words. But this issue is largely related to Nuance’s speech recognition technology in the BlackBerry OS and not the headset, so the HS-700 shouldn’t catch all the blame. Bottom line: The BlackBerry HS-700 is a bit pricey at $130, and I’d probably wait for that price to drop a bit before running out to pick it up. But I still strongly recommend the device as one of my favorite Bluetooth headsets ever. And it’s not just for BlackBerry users, either; iPhone/DROID/Pre/whatever users should also find a friend in the BlackBerry HS-700. Learn more about RIM’s brand new Bluetooth headset or purchase the HS-700 on the company’s website. Then read my review of the BlackBerry HS-500 headset to see the new HS-700’s advantages over RIM’s older model. Al Sacco covers Mobile and Wireless for CIO.com. Follow Al on Twitter @ASacco. Follow everything from CIO.com on Twitter @CIOonline. Email Al at ASacco@CIO.com.